When you see your smile in the mirror, in a photograph, or online, Fayetteville dentist Dr. Ruff and his team want you to see a smile that is pleasing to you. With so many treatment options available today in the category of cosmetic dentistry, there’s really no reason to settle for a smile that is less than perfect. Teeth whitening is a popular choice among the cosmetic dentistry treatments offered at Ascot Aesthetic Implants & Dentistry in Fayetteville, NC. With professional level teeth whitening, you can achieve impressive results and feel confident in your smile once again. Studies indicate the people who have whiter smiles are often thought to be friendlier, more successful and even smarter than peers with dull teeth. 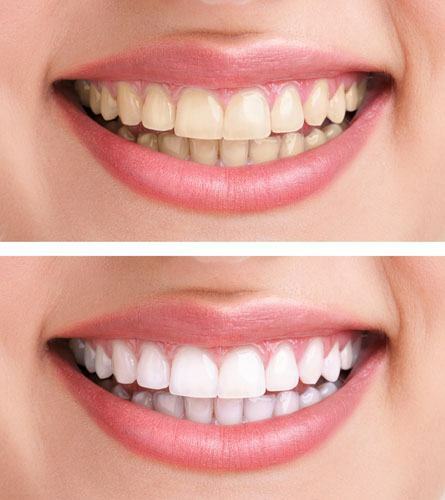 Why not give yourself the advantage of a healthy and white smile with convenient teeth whitening? Why Choose Ascot Aesthetic Implants & Dentistry for Teeth Whitening? What Does Teeth Whitening Treat? We can reverse the typical darkening of tooth color associated with aging, as well as the effects of food stains and traumatic tooth injury. Some of our patients have teeth that are discolored because over exposure to fluoride during childhood when their permanent were developing. Others may have taken the antibiotic tetracycline, which can also darken your teeth. Whatever the reason, our teeth whitening system packs a powerful combination of bleaching ingredients to ensure safe and effective results.